French music streaming company Deezer is attempting to carve out a niche for itself in a global industry dominated by the likes of Spotify and Apple. Here is a guide to the main players in the fast-growing, multi-billion-dollar market. Founded in Stockholm in 2006, Spotify is the global market leader in terms of paid subscribers—it has more than 60 million, and 140 million active users. It offers over 30 million songs and features include bespoke playlists made for users weekly. It runs an ad-supported free service. Its paid, ad-free service is available from about $10 a month and allows users to choose, skip and download songs. Analysts say its large user base and data gives it the edge in music recommendation. Spotify is eying a $13 billion U.S. stock market listing by the end of this year or beginning of next year, sources have told Reuters. Two years from its launch, Apple Music (aapl) is the industry’s number two player with about 28 million paid users. Unlike Spotify, it doesn’t have a free service. Subscribers can access a catalog of about 40 million songs for about $10 per month—or nearly the entire iTunes catalog, which boasts 45 million songs. Apple has been seeking to set itself apart via exclusive content, striking deals with individual artists such as Canadian rapper Drake, something Spotify is resisting. It also allows users to integrate their own iTunes libraries. Amazon Music Unlimited, in third place, has about 16 million paid users. It offers access to about 40 million songs to its Amazon Prime members for about $8 per month, and about $10 for non-members. Amazon (amzn) also offers Prime Music, which Prime members get for free and offers access to over 2 million songs and thousands of playlists and radio stations. Like Apple, Amazon promotes its one-stop-shop advantage and integration with its devices such as digital assistant Alexa. 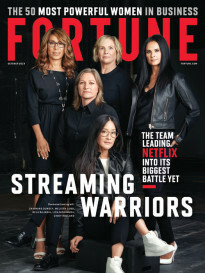 Get Data Sheet, Fortune’s tech newsletter. The 10-year-old French company, at number four, has 9 million paid users, 12 million active users and 43 million tracks. 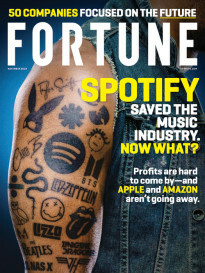 It offers a “freemium” model like Spotify’s, with a monthly subscription of about $10. Its Flow feature recommends music based on users’ tastes and locations and aims to guess what people may want to listen to at home, at work, or in the gym. Its Deezer Next program launched this year aims to secure local content by spotting and promoting emerging artists, often in niche genres. Google (googl) launched its music streaming service in 2011 and offers about 40 million songs. Users can get full access to the library, build playlists and download music for about $10 a month. Free users are not able to build playlists. The tech giant allows users to watch music clips while listening to tracks by bundling the app with YouTube, which it also owns. Google, which developed the Android operating system, has also installed Play Music on most of its devices. Official numbers are not yet available, but a survey of Android users by 7Park Data indicated that Play Music has almost as many active users in the United States as Spotify. The Berlin-based company was born a decade ago. It has over 175 million users—more than any other service—but almost all are non-paying. SoundCloud is widely used by DJs and electro music fans, with its user-generated content a key differentiating factor. But the company has repeatedly faced financial problems, forcing it to introduce advertising in 2014 and an ad-free subscription of about $10, SoundCloud Go, the following year. It fired more than 170 people in July and called on investors to rescue it from bankruptcy. Its valuation fell from $700 million to $150 million. Tidal was founded by Norwegian tech company Aspiro in 2014 and bought by American rapper Jay-Z the following year for $56 million. It offers only subscription services, giving users access to over 48 million tracks and 175,000 music videos as well as exclusive content for about $10 a month. Earlier this year, U.S. wireless carrier Sprint (s) bought a third of Tidal for a reported $200 million, valuing the company at about $600 million. Tidal said last year it had exceeded 3 million users. Pandora (p) is a streaming Internet radio service available only in the United States. It can be accessed for free, but Pandora Plus users pay about $5 a month for unlimited skips, higher audio quality and replay options while Premium users get offline, on-demand listening as well as customizable playlists for about $10.